Successfully Added iPhone and iPod RCA Composite Cable + USB to your Shopping Cart. 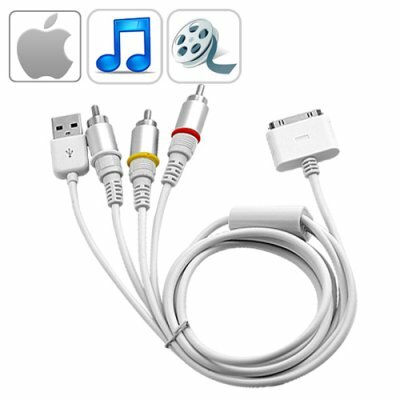 This composite RCA cable can also be used to connect your iPhone or iPod directly to your home stereo system, thus enabling you to enjoy listening to your music on your home stereo speakers for a room-filling audio experience. This premium quality Apple cable supports all iPhone models, (iPhone 2, iPhone 3, iPhone 3Gs, iPhone 4 (up to 4.0 firmware)), as well as iPod, iPod Touch and Nano. Another great iPhone and iPod accessory brought to you at a wholesale price from Chinavasion. Click "Add to Cart" right away, and we'll express ship you a sample. List this Apple accessory on your drop ship website or eBay-listing page to start making profit right away. If you're a store owner, then purchase in bulk for greater discounts and see them fly of the shelves.